The standard poodle makes an excellent hypoallergenic family pet. There are 55 breeds on the Pet Wave Hypoallergenic Dog Breed Center list. However, not all of these dogs are right for a family with children. Careful consideration should be given to ensure you choose a breed that is good for families with children who suffer from allergies. 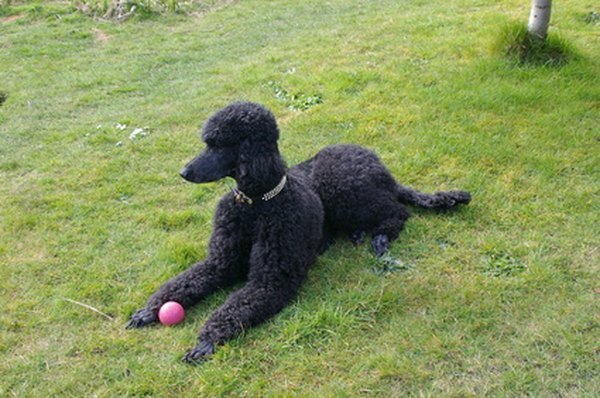 The standard poodle is a very intelligent breed of dog that can be trained to do most anything. The breed is much more rugged and hardy than many people think. The standard poodle has its roots in water-fowl hunting. Generally, the breed is friendly and playful, making for a great family pet. The dog's fur can be kept short or even shaved. Both the goldendoodle and the Labradoodle stem from the standard poodle. As you might have guessed, the goldendoodle is a golden retriever mix and the Labradoodle is a Labrador retriever mix. When bred resposibly, these mixed-breed dogs can combine the best traits from both their breeds. Both golden retrievers and Labrador retrievers are excellent family pets, but they are not hypoallergenic. When mixed with a standard poodle, the result is a playful and hypoallergenic family pet. The standard schnauzer can be a very good family dog if it is properly trained. This breed might not be a good choice for a first-time dog owner, as some schnauzers can be high-strung and a little pushy. Many behavior problems with the standard schnauzer can be corrected with an increase in exercise. These dogs are also known to chase smaller animals, so they aren't good for homes with other pets. Many different breeds of terrier are hypoallergenic. Out of the 55 breeds of hypoallergenic dogs listed on the Pet Wave website, 23 are terriers. Not all of the terrier breeds are good with children, but with the right training some of them make great family companions. For instance, the miniature bull terrier is good choice for families because of both its size and temperament. Both the Irish terrier and rat terrier have also been known to make good family companions when properly trained and exercised. Terriers are generally sporting dogs and, as such, need a strong leader and a lot of exercise.